Over the past 40 years, U.S. manufacturing has been off-shored to places like China and India. In 1965, manufacturing comprised 53 percent of the economy. By the end of the 1980’s, it had shrunk to a 39% share. By the first decade of the 21st century, manufacturing fell into the single digits at 9%. Not surprisingly, the number of plastic injection molders in the United States has dropped drastically since the 1980’s as well. To survive in these tough economic times, American molders have become stronger than their foreign competitors. Automation and lean manufacturing principles allow many to compete on price. Still others have created specialty molding applications for specific industries. The key to survival is offering a differentiating factor that OEM’s cannot find in China. Want to know how to make perfect plastic parts? Get our new eBook. One advantage The Rodon Group offers is innovation. With experience in many industries and many applications, we tend to look at part design and manufacturability a bit differently. We look at each project and ask one key question – how can we do it better? When a project is first submitted for a quote, we spend time fact finding. How will the part be used? Will it need to comply with certain regulations? Will there be additional assembly? Will it be exposed to the elements, chemicals, heat? Once we have an understanding of how and where the part will be used, we begin to look at ways to improve the design, improve manufacturability and ultimately the per part cost. In one instance, a customer brought us a product that was molded into two parts and was then assembled. 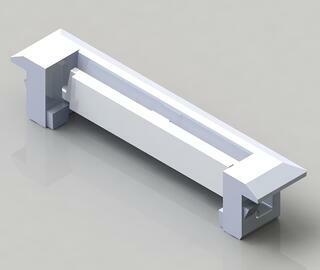 After doing several CAD renderings, we redesigned the part into one piece. This not only the saved the company on tooling and manufacturing costs but secondary assembly as well. Another project also required a great deal of innovation and engineering to develop a cost effective solution. We were asked to quote on a piece comprised of three component parts. One of these parts was a metal spring that was inserted into the two piece assembly before final installation. Working with our resin suppliers, we developed a solution made entirely out of plastic. The new design incorporated a built-in spring that was made from automotive grade resin. This piece was assembled with the outer housing to create the final product. The new part is now rust and corrosion resistant and will provide a much higher performance level than the original design. And of course, the streamlined design also minimized tooling costs and assembly costs, providing overall savings for a much better product. Do these scenarios sound like a situation you are facing? Have you been looking for a custom injection molder with a high-level of engineering expertise? Do you need to find a better, more cost-effective solution for your part design? If you are looking for an innovation solution to your project, give us a call at 1-800-523-8792 or email is at sales@rodongroup.com. We'll use our years of experience to figure out how we can do it better for you.